This sandy bay beach on the Eastern Shore is a bit too industrial for sunbathers so it is a perfect place for dogs to romp - and they can do so off-leash. Located just south of the Bay Bridge , there are splendid views of the Chesapeake Bay and bridge. The pride and joy of William Gillette’s 184-acre estate was his three-mile narrow gauge railroad that looped through the woods below the castle. The rails are gone but the bed makes a fanciful pathway for your dog’s travels through the park. Your dog can enjoy the views from three concentric routes at different elevations, ranging from 2.5 to 7 miles before tackling the short but steep climb to the summit. Miles and miles of open sand await your dog south of the walk-in campground every day of the year. Your dog is welcome to come along on your exploration of the grounds where more Americans died in one day than at any time in the nation’s history. The Snavely Ford Trail is a 2.5-mile footpath that is a serene route for contemplation. The former estate of William duPont, Jr. rumbles across more than 5,000 acres of rolling hills and grass sweet enough to nurture Barbaro, the legnedary 2006 Kentucky Derby winner. Although it is paved and often crowded, the 2.4-mile trip around the centerpiece lake in this award-winning park will set any dog’s tail to wagging. Hey, this is where Presidents come to hide out in Camp David so you can surely disappear in the wooded glens and hillsides with your dog here. “If your dog is fat,” the old saying goes, “you aren’t getting enough exercise.” But walking the dog need not be just about a little exercise. Here are 10 cool things you can see in Maryland while out walking the dog. The BWI Airport is the only airport in America that features a recreational trail. The Thomas A. Dixon Jr. Aircraft Observation Area on this 12.5-mile paved trail, opened in 1994, provides an ideal spot to watch the planes land directly in front of you. You won’t be able to see the rubber hit the ground here but can see it from other spots along the trail. To get the feel of a big jet soaring directly over your head walk down a half-mile to the east (you’ll see stop signs) and stand here. It won’t be only jets using the airport either - you can spot an occasional propeller plane as well. Although only 20 acres in size, the Bay Shore Park was considered one of the finest amusement parks ever built along the Chesapeake Bay. Built in 1906, the park featured an Edwardian-style dance hall, bowling alley and restaurant set among gardens and curving pathways. There were rides such as a water toboggan and Sea Swing. Visitors would come out from Baltimore on a trolley line. Most of the park was torn down after its closure in 1947 but you and the dog can explore the remains of the turn-of-the-century amusement park, including the wood-framed trolley station and the restored ornamental fountain, in North Shore State Park. Complete your tour with a hike down the old Bayshore Pier which juts almost a quarter-mile into the wind-swept Bay - a diving board once operated here where benches are today. The chance to see bald eagles, especially in the winter, is a prime attraction of Susquehanna State Park. The great piscavorious birds favor massive nests in the 100-foot treetops along the banks of the Susquehanna River from which they dive and pluck stunned and splattered fish from the spillways beneath the Conowingo Dam, America’s longest concrete-slab dam. At the South Overlook in Downs Memorial Park is an osprey nesting platform to observe the activities of the fish-hunting hawk. Although preferring a flat-topped tree, ospreys will happily choose man-made structures such as these for homes. Out on the water, an osprey will hover above the surface looking for a fish before striking with talons extended. An adult bird will succeed one time in four with this maneuver. If you aren’t lucky enough to spot the eagles in flight try hiking the Hashawha Trails at the Bear Branch Nature Center in Carroll County. Here is the chance for your curious dog to look a bald eagle in the eye. The Nature Center maintains a M.A.S.H. unit for raptors who have been injured too badly to be returned to the wild. The cages for eagles, kestrels, hawks, owls, turkey vultures and other recovering birds of prey are on the Vista Trail. Cedarville State Forest is home to the headwaters of Zekiah Swamp, Maryland’s largest freshwater bog. Plants that live here have to make do with nutrient-poor soils and two have adapted by living off the juices of insects: the northern pitcher plant and the roundleaf sundew. The pitcher plant lures victims with the promise of cool drink that turns deadly when they can’t climb back out the ewer-shaped flower because the tiny hairs are facing in the wrong direction. The low-growing sundew traps its prey in sticky tentacles. The first chromium mines in America were opened in rural Baltimore County in 1808 and from 1828 to 1850 just about every scrap of chrome in the world came from here. Along the Choate Mine Trail in Soldiers Delight Natural Environmental Area you can stand in front of the entrance to the Choate Mine and look into the slanting hole kept open by half-timbered posts. So close the cool air will rustle your dog’s fur. The mine once ran 200 feet deep and 160 feet across. During the Civil War, a Union private camped at Great Falls Tavern discovered gold-bearing quartz while tending to his chores. After the war he returned to Great Falls and began mining operations that triggered a mini-gold rush to the area. Although the Maryland Mine was active from 1867 until 1939, it yielded less than $200,000 of precious metal. The Falls Road Spur takes you to the ruins of the mine and mine diggings can be seen at several places on the trails. Thomas Winans made his fortune building the Russian transcontinental railroad for Czar Nicholas I. He learned railroading from his father Ross who invented the swivel wheel truck that enabled trains to negotiate curves. Their railroad heritage is preserved at Leakin Park in Baltimore by the Chesapeake & Allegheny Live Steamers who maintain three miles of track for miniature steam trains that carry passengers (sorry, no dogs) free of charge the second Sunday of every month. Capable of speeds of 25 mph, the trains rumble along instead at a passenger-friendly 6 mph. The natural beauty of Quiet Waters Park in Annapolis is augmented by the outdoor sculptures that grace the grounds. Sculptures are chosen by jury from national and international artists working with a variety of material and installed on a rotating basis. When your dog tires of sniffing the statuary, you can take her to Anne Arundel County’s first dog park at the back of Quiet Waters. Not only are there two large fenced-in enclosures for big and small dogs but there is a dog beach on the South River for serious dog paddling. The forests deep in the rugged Catoctin Mountain Park provided ideal cover for a whiskey still, made illegal by the onset of Prohibition in 1919. On a steaming July day in 1929 Federal agents raided the Blue Blazes Whiskey Still and confiscated more than 25,000 gallons of mash. Today the airy, wooded Blue Blazes Whiskey Trail along Distillery Run leads to a recreated working still and interprets the history of whiskey-making in the backwoods of Appalachia. From the parking lot on US 1 at the Big Gunpowder Falls there is great canine hiking on both sides of the river in either direction. On the opposite bank heading downstream on the Big Gunpowder Trail, about a mile down, are the Pot Rocks. You and the dog can walk out and examine the conical depressions created in the bedrock by swirling waters armed with millions of years worth of grinding cobbles. These unique potholes can be a foot or more deep. Keep hiking another two miles down the river and you reach the last series of rapids on the Gunpowder as the water leaves the hilly Piedmont region and slips into the flat Coastal Plain. The Baltimore & Ohio Railroad built its first line west along the Patapsco River and the trails at Henryton Road in Patapsco State Park follow a particularly historic stretch of the Old Main Line. On a rainy night in 1830 Irish laborers, tired of waiting for back pay, rioted and managed to destroy all this track for five miles to Sykesville. The disturbance prompted the first ever American troop transport by train when the Baltimore militia rode out to squelch the rampage. When the trail crosses this section of railroad track look to the west and see the Henryton Tunnel. Opened in 1850, it is the second-oldest tunnel in the world that remains in active railroad use. 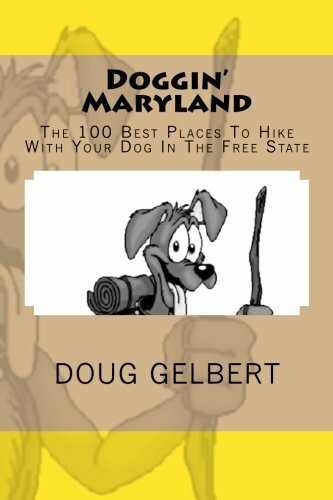 The 3,118-foot Paw Paw Tunnel is the most unique hike you can take with your dog in Maryland. Make sure to bring a flashlight - there are no lights in the tunnela nd it is long enough to envelop you and your dog in complete darkness.